The United Nations Office on Drugs and Crime released the 20th edition of its World Drug Report (WDR) in June. The figures are far from heartening: In 2015, about a quarter of a billion people (around five percent of the global adult population) used drugs at least once. Of these, about 29.5 million people globally or 0.6 percent of the global adult population engaged in high risk consumption of drugs (people who inject drugs, use drugs on a daily basis etc.) and/or people diagnosed with drug use disorders. “The magnitude of the harm caused by drug use is underlined by the estimated 28 million years of “healthy” life (disability-adjusted life years (DALYs)) lost worldwide in 2015 as a result of premature death and disability caused by drug use,” says the 2017 WDR. Opioids comprise of a combination of internationally controlled substances, particularly heroin and prescription medicines that are either diverted from the legal market or produced as counterfeit medicines on a large scale. These counterfeit medicines are made to look like pharmaceutical products. “The emergence of derivatives of prescription medicines, classified as new psychoactive substances (NPS), particularly fentanyl analogues, has been associated with rising numbers of overdoses, including fatal overdoses, among opioid users,” says the report. Heroin, commonly called smack, is obtained by acetylation of morphine –extracted from the latex of poppy plant. Cannabis is obtained from the hemp plant, parts and combinations of which produce marijuana, hashish/hash, charas and ganja. Cocaine is obtained from the coca plant. It is also known as coke and crack, among its other names. Apart from these, there are stimulant drugs of amphetamines that increase the activity of certain chemicals in the brain. “Disorders related to the use of amphetamines account for a considerable share of the global burden of disease attributable to drug use disorders, second only to those related to the use of opioids. Available data show that, among amphetamines, methamphetamine represents the greatest global health threat… In addition to the established and expanding market for methamphetamine in East and South-East Asia and Oceania, there are growing concerns about methamphetamine use in North America, South-West Asia and parts of Europe,” says the report. “DALYs attributable to morbidity and mortality resulting from all causes of drug use have increased overall in the past decade,” shows the WDR 2017. Opioids remain the most harmful drug type in terms of health consequences – 70 percent of the global burden of disease attributable to drug-use disorders or 12 million DALYs were attributable to opioids alone. Additionally, the opioid market is becoming increasingly more diversified while NPS continues to evolve such that the 260 NPS in 2012 nearly doubled to 483 in 2015. The US accounted for one-fourth of all drug-related deaths, including through overdosing. Cases of cocaine overdosing “increased markedly” in the US in the years between 2012 and 2015, much of which is linked to the use of cocaine in combination with opioids. Additionally, cocaine use appears to be increasing in its two largest markets of North America and Europe. Globally, DALYs attributed to cocaine-use disorders increased from 7,29,000 in 2005 to 9,99,000 in 2015. 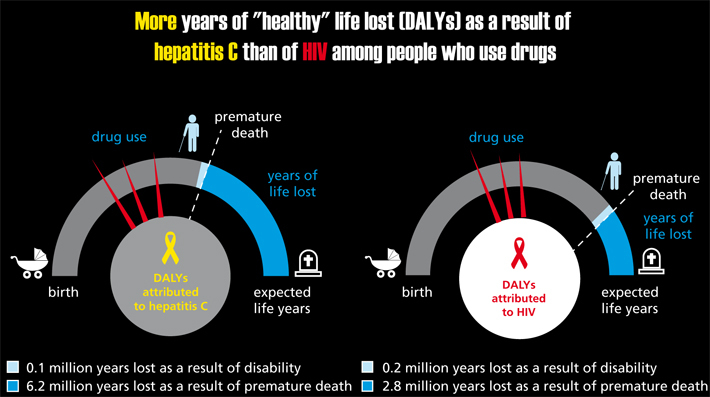 Worldwide, 12 million people who inject drugs (PWID) face some of the most severe health consequences associated with drug use, with a rampant incidence of hepatitis C – more than half of PWID, or 6.1 million people, are currently living with hepatitis C and about one in eight, or 1.6 million people, are living with HIV. “Overall, three times more people who use drugs die from hepatitis C (2,22,000 people) than from HIV (60,000 people)…despite recent advances in the treatment of hepatitis C, access remains poor, as treatment remains very expensive in most countries,” says a press statement from the UNODC on the drug report findings. Opium production is up and the cocaine market is thriving, the UN findings show. Global cultivation of opiates has gone up by 8 percent covering 3,04,800 ha of land while the global production of opium is up by 34 percent standing at 6,380 tons that was used by 35 million people in 2016. Simultaneously, the global seizures of opium have gone up by 11 percent while seizures have gone down by 5 percent for heroin (80 tons) and 54 percent for morphine (8.8 tons). Opium is illicitly produced in around 50 countries worldwide, with the main areas of production being located in three subregions, as categorized by the UN drugs agency. Countries in South-West Asia – mainly Afghanistan – with supply markets in neighbouring countries and in countries in Europe, the Middle East, Africa and South Asia, with small proportions going to East and South-East Asia, North America and Oceania. Countries in South-East Asia, mainly Myanmar and, to a much lesser extent, the Lao, that replenish markets in East and South-East Asia and in Oceania. Countries in Latin America, mostly Mexico, Colombia and Guatemala, that by and large supply to markets in the US and limited markets in South America. The more-than-30-pecrcent increase in poppy cultivation was primarily because of a spike reported in the cultivation of opium poppy in Afghanistan that year which recorded a 43 percent increase from the levels of the previous year, “mainly the result of a partial recovery in the extremely poor yields in its southern and western provinces recorded a year earlier”. “With 2,01,000 ha under opium poppy cultivation, Afghanistan accounted for roughly two-thirds of the estimated global area under illicit opium poppy cultivation in 2016. Though there is no data for last year in Myanmar, but in 2015 with 55,000 ha under poppy cultivation – 20 percent of the total area of cultivation – it was the world’s second largest opium-producing country that year. A socio-economic survey undertaken by the UNODC in 2016 in Shan state, however, shows that though Shan state accounted for 90 percent of Myanmar’s total poppy cultivation and opium production, the proportion of villages producing opium poppy fell from 31 percent of all villages in Shan State in 2015 to 22 percent in 2016, which is a substantial decrease of almost 30 percent. “However, this trend has been offset by an increase in the size of the average area under opium poppy cultivation, from 0.4 ha to 0.6 ha per household where cultivation is taking place, suggesting an increasing concentration of opium poppy cultivation in Shan State,” says the UN. The third largest area worldwide under opium poppy cultivation is in Mexico with a little more than 26,000 ha under cultivation based on estimates from the year 2014-15. The large opium production in Afghanistan finds easy markets in Pakistan, India and its other neighbouring countries. In 2015, the largest quantities of opium globally were seized in Iran of an astounding 4,78,814 tons of cargo followed by Pakistan, Afghanistan, France and China. For the same year, the largest quantities of morphine seized globally was from Iran followed by Pakistan, China, the US, Mexico and India (61 tons) and the largest heroin seizure was in Pakistan followed by in Iran, China, Turkey, the US and Russia. “In line with increases in opium production reported in South-East Asia in recent years (30 percent over the period 2010-2015), heroin and morphine seizures related to opiates produced in South-East Asia rose by 88 percent, from 7.1 to 13.3 tons, over the period 2010-2015,” the UN drug agency’s findings reveal. Similarly, in recent times the vast majority of heroin seized in China originates in Myanmar. There have been “perceived increases” of heroin use linked with trafficking of Afghan opiatesin Afghanistan, Pakistan, Iran, Tajikistan, and the UAE – all of these countries are also used as transshipment locations. “Information for India as a whole is not available, but there are indications of an increasing trend in the use of opioids in the Indian State of Punjab, bordering Pakistan. “According to a study conducted in 2015, Punjab, which accounts for 2.2 percent of India’s total population, was reported to have around 8,60,000 users of opioids (0.5 percent of the population aged 15-64 years), including 2,30,000 who were dependent on opioids and nearly 75,000 who injected opioids,” states the UNODC report. 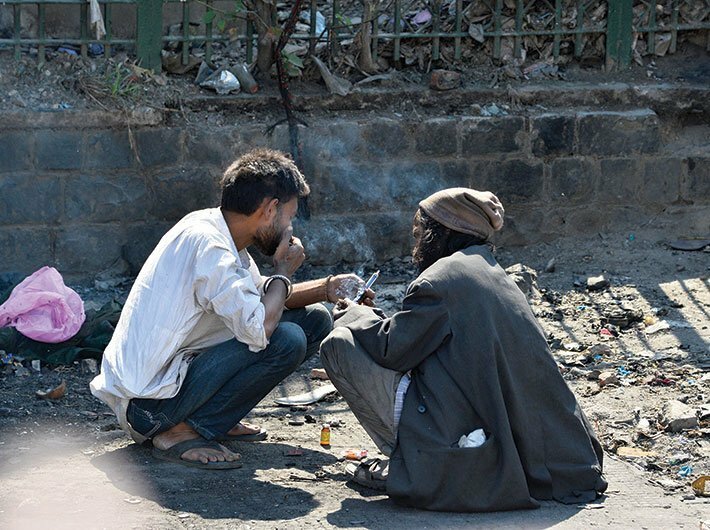 The fresh data for Punjab indicates an increase in opioid use since the last national survey in 2001, which estimated that some 5,00,000 people in India were opioid dependent. Similarly, data on drug production, trafficking and use indicate an “overall expansion” of the market for cocaine worldwide. Following a long-term decline, coca bush cultivation increased by 30 percent during the period 2013-15, mainly as a result of increased cultivation in Colombia. The global cultivation of cocaine went up by 31 percent with 1,56,500 ha of land under coca cultivation in 2016. Total global manufacture of pure cocaine hydrochloride reached 1,125 tons in 2015, mainly on account of three Andean countries of Bolivia, Columbia and Peru that returned to 2008 production levels and representing an overall increase of 25 per cent over 2013. Ninety percent of cocaine trafficked to the US in 2015 originated in Columbia, and with large increases in cocaine manufacture in the past two years, the war-torn country has re-emerged as the main supplier of cocaine to Europe. Cocaine markets in the US and Europe have been expanding again. Only seven percent of the coca leaf used in the manufacture of the cocaine found in the US market originated in Peru. Cannabis plant cultivation was reported on the territory of 135 countries in the period 2010-15, covering 92 percent of the world population. Morocco remains the world’s biggest source of cannabis resin, followed by Afghanistan, Lebanon, India and Pakistan. There were 183 million global users of cannabis in 2015. The global seizures of cannabis herbs went down by two percent (5,781 tons) over the previous year while the seizure of cannabis resin went up by six percent (1,536 tons) the same year. According to the UN analysis, the main trafficking routes of Afghan opiates out of the country are through three stretches. One, the so-called “Balkan route” which extends through Iran and Turkey to West and Central Europe. Second, a northern route through Central Asia that travels up to Russia. The second largest seizures were reported in the northern route. Heroin leaves Afghanistan via Tajikistan for onward trafficking either directly to Kazakhstan, or to Kyrgyzstan or Uzbekistan and subsequent trafficking to Kazakhstan and finally to Russia. And the third is a southern route, where the cargo goes through Pakistan and India, part of which goes to the Persian Gulf area and the Middle East and the other goes to South-East Asia and Oceania. Afghan opiates trafficked on the southern route go to Pakistan and partly to Iran for “subsequent shipment to the Gulf countries and East Africa for shipment to Europe, either directly by air or via Southern or West Africa by air or by sea”. Alternatively, drugs are trafficked along the southern route to India and other countries in South Asia for subsequent shipment to Europe or North America, which is mostly to Canada. The European countries most affected by opiates trafficked on the southern route in recent years are Belgium, Italy and the UK. Seizures of heroin and morphine made along these routes, plus seizures made in Afghanistan, Pakistan and West and Central Europe, accounted for 75 percent of global heroin and morphine seizures in 2015, estimates the UN. Iran reported that that 85 percent of the heroin that it seized in 2015 transited Pakistan prior to arriving on Iranian soil. Additionally, there are two new routes that seem to be developing. The first is a modification of the Balkan route that circumvents Turkey – owing to the huge refugee flow from Syria, pushing traffickers to find alternative routes. Heroin trafficked along this route is shipped from Iran to Armenia or Azerbaijan and then to Georgia for shipment by sea to Ukraine before being trafficked to Romania or Moldova, or directly from Georgia to ports along the Black Sea in the EU countries, notably Romania, before “re-entering the eastern branch of the main Balkan route in Romania for trafficking onward to the Netherlands and other countries in West and Central Europe”. Romania that previously reported that vast majority of its cargo transited through Bulgaria, for the first time in 2015 saw 93 percent of its heroin transiting through Ukraine. At the same time, “a route from Afghanistan to Pakistan and Iran, the Caucasus countries and Russia has also been developing”. Russia reported that about 20 percent of the heroin seized on its territory in 2015 had been trafficked by this route. A UN Security Council (UNSC) Committee established pursuant to a resolution in 2011 estimated that the overall annual income of the Taliban is about $400 million, half of which, most likely, comes from the illicit narcotics economy by taxing entities involved in illicit opiate production, manufacture and trafficking in Afghanistan. The Taliban’s involvement in the drug trade is “well documented” – the consolidated UNSC Sanctions List contains a number of Taliban leaders who are accused of direct involvement in drug trafficking. UNODC estimates that non-State armed groups “raised about $150 million in 2016 from the Afghan illicit opiate trade in the form of taxes on the cultivation of opium poppy and trafficking in opiates”. However, the overall drug-related income should, presumably, be much higher than this. Though there is no causal relationship that has been established between drug production and terrorism but the Afghan case can give a “great insight” into the potential link between the two. Afghanistan accounted for about 13 percent of all terrorism-related deaths worldwide (followed by the Islamic State, or IS, which accounted for 4 percent of the total deaths in 2015) between 2000 and 2015 with the Taliban being responsible for 73 percent of these deaths in the war-ravaged country for the same period. “Between 26 percent and 85 percent of the area under opium poppy cultivation is estimated to be under varying degrees of Taliban influence,” the UN estimates. Colombia has had a similar experience – the area under coca cultivation shrank by 70 percent between 2000 and 2013 during a decline in the number of operations by non-State armed groups over the same period. The dreaded IS terrorist group operating in Syria, and recently flushed out of Iraq, and other armed groups in Iraq and Syria, reportedly, produce and consume ‘captagon’ tablets – typically amphetamine mixed with caffeine. “The group operates in an area likely to be a manufacturing hub, according to seizure data, but no conclusive evidence has emerged so far, as other groups also operate in the same area,” the UN says. Boko Haram, another terrorist organisation operating in Nigeria and neighboring countries, reportedly is involved in smuggling heroin and cocaine across West Africa. This was established also during trials of Boko Haram members in Chad – “the court of appeal heard that considerable quantities of psychotropic substances had been recovered and that Boko Haram members were regularly involved in the trafficking in and consumption of those substances”. According to UNODC, further up in Africa, there is evidence that suggests that Al-Qaida in the Islamic Maghreb has been involved in cannabis and cocaine trafficking, “or at least in protecting traffickers, but that its overall income from the drug sector appears to have been rather modest”. Myanmar’s Shan state that accounts for most of the opiate production in country has been wracked by exceptional violence as recently revealed by the UN special rapporteur for the human rights situation in Myanmar Yanghee Lee. It is unclear, however, if there is a link between opiate cultivation and the increase in violence in the region. The exponential spread of technology has only made drug trafficking easier in recent times. “The darknet allows users to buy drugs with a cryptocurrency, such as bitcoin, and have their purchases delivered to them in a concealed manner,” states the UNODC report. 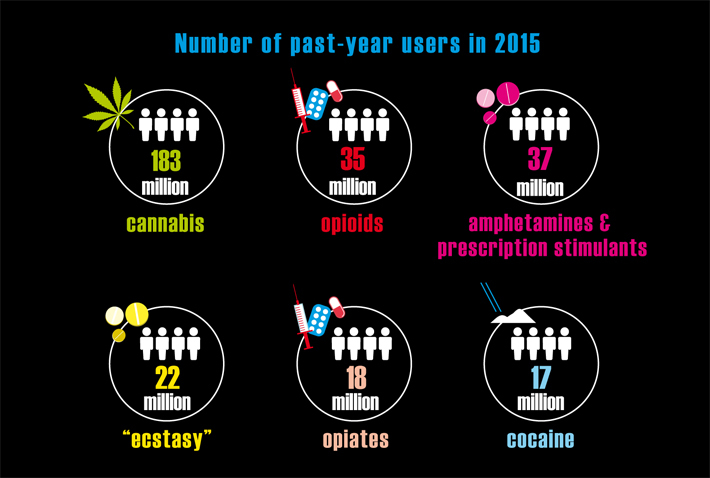 Typical buyers from such transactions are recreational users of cannabis, “ecstasy”, cocaine, hallucinogens and NPS but are less likely to be heroin or methamphetamine users. An analysis of 17 Organization for Economic Cooperation and Development (OECD) countries shows the detrimental effect that such illicit transactions may have on the overall economic health – a $1 billion increase in money-laundering could reduce overall economic growth by between 0.03 and 0.06 percentage points.